One of the biggest product development challenges today is ensuring electromagnetic interference is optimally controlled. With proper electromagnetic compatibility (EMC) testing and design, you can ensure the correct operation of various devices in the same electromagnetic environment. EMC is achieved by addressing both emission and susceptibility issues by taming the sources of interference and by strengthening the potential victims. emissions testing and immunity testing. EMC emissions involve two types of testing: radiated emissions and conducted emissions testing. With radiated emissions tests, the goal is to check for unplanned emissions that exceed a given pass band as defined by the class of the product. Conducted emissions testing involve shorter frequency range — for example, 30 Hz to 10 KHz. Immunity testing is required for EMI compliance in the U.S. for medical devices and for a wide range of consumer products in the EU. A number of immunity tests may be required depending on the type of device and its application. EMC testing is time-consuming, and failed tests can delay product launches. Your budgets will be stretched, and your reputation is at stake if you are not meeting customer’s demands. Many devices fail during EMC testing, often during radiated emissions testing. By building EMC testing into the product design and development phases from day one, one can build a product that has a lower risk of failing EMC tests at the end. With pre-compliance EMC testing, you perform EMC tests and incorporate best practices throughout the design and development process. This allows you to meet EMC compliance more easily and effectively during your final testing. The best way to avoid expensive retesting and noncompliant EMI issues is by checking for emissions from your device throughout the product development cycle. Pre-compliance EMC testing has multiple benefits. The earlier in the product development cycle you can identify issues with emissions, the easier it is to correct the issues. Also, the solutions or options to correct EMI are more in the early stages of product development versus later. Correcting EMI issues after compliance testing is costly and results in loss of precious time versus fixing upstream in the design phase. Imagine leaving EMC testing of your device at the end of the development of the product. Any issue that may have been smaller and possibly easier to isolate early on is now more complex and amplified due to more parts and subsystems within your device. For example, it’s much cheaper to make an EMC fix on a circuit board versus correcting once the design is final. As a specific example, a resistor-capacitor low-pass filter on data signals before crossing a radiating cable may cost you .1 to .5 cents per PCB. However, if the PCB is finalized and you need to solve against the radiating cables, a cable choke will cost you more than $1 per cable. Mechanical changes, EMI shields, use of EMC foam and other design changes are made to counter emission issues. When EMC testing is done early, it allows you to make better decisions on types of changes to make to become EMC compliant. When testing is integrated into product development, one can tap into a well-known testing company for ongoing support. It can provide testing infrastructure and subject matter experts during the entire product development cycle. This is an upfront investment that pays off by keeping your project on time and by reducing risks from noncompliance. Experienced design engineers that offer pre-compliance EMC testing as part of their suit of services will continuously look for areas of risk during product development. For example, testing during product development can provide the designer options to add in preventative measures in the form of additional circuitry, or other mechanical or system design changes. When product designers come up with a fix, it is helpful to test it immediately before making major design changes. If you are not performing pre-compliance EMC testing, you may be overengineering your product to ensure it meets EMC compliance at the end. Since you are not testing along with design and development, you may be adding countermeasures which may be redundant. These measures may considerably add to your product cost. Overdesign or overengineering is common across various industries. This can include coding for software, designing automobiles or airplanes, or design of bridges and building structures. With pre-compliance testing, you have the option to test more often and throughout the design and development. This can help you to avoid using parts with higher-than-necessary specs or even avoid parts you may be incorporating to stay EMC-compliant. This is not a test, but it’s one of the most ignored pre-compliance strategies. You can do a detailed and systematic schematic and layout design review as part of your pre-compliance processes. This can significantly reduce the risk of your product failing at an EMC test lab. You can detect many potential emissions and immunity issues in a design review. A solid design review will catch many of the root causes of emissions and immunity problems even before your first test PCB is created. If you do not have in-house expertise for EMC-compliance design, work with a testing company that can provide this service. This can increase your first-time pass rate. Pre-compliance EMC testing can be done by hiring a testing lab or by doing it on your own once you have the right equipment and testing gear. You can rent equipment and hire personnel from a testing company for pre-compliance testing. Professional testing labs have fully compliant test gear, which will allow you to perform tests with high accuracy. A reliable test lab will also be able to assess your test device and provide recommendations on potential root causes. This way, you can focus on addressing those as part of your pre-compliance effort. Some labs can provide turnkey pre-compliance and final compliance services as one package, which can keep your overall costs low. NTS offers a wide range of services to help clients meet EMC compliance across various industries – consumer, industrial, automotive, medical, military, space, aircraft, telecommunications, etc. Our range of EMC/EMI services includes engineering, design analysis, testing and technical training. NTS also has the largest network of commercial EMC testing labs in North America. We have a deep knowledge of various EMC compliance standards, and we are fully versed in FCC and CE standards and testing requirements. Our labs and equipment use the latest technology and are powered by the most respected and experienced engineers and technicians. We have people, processes, tools and knowledge capabilities that allow us to test to extreme limits and complex standards. Electrostatic discharge (ESD) testing measures a device’s ability to tolerate discharge events. These events occur when a user touches the device and another metallic surface at the same time. Harmonic frequencies greater than 50 Hz and voltage dips in the 5 to 15 Hz range can cause harmful interference for electronic devices. Devices need to be tested under these conditions to meet EMC compliance. Electrical fast transients testing (EFT) simulates a common type of real-world interference which was previously neglected. EFTs involve a high-frequency disturbance on a power line which occurs as a result of inductive loads being turned on or off. Testing for voltage dips and interrupts (VDIs) involve simulating the conditions of voltage dips and voltage interruptions. The device is tested in the simulated environment to assess tolerance against VDIs. Surge testing is a key part of EMI analysis. NTS produces a low frequency, high energy electrical transient to simulate the effects of a lightning strike on a nearby power line. The device’s response is measured under these stringent conditions to test its tolerance against the surge. Military and Aerospace applications commonly require radiated susceptibility tests. NTS can perform radiated immunity testing up to 200V/m field strength in accordance with various military standards from 10kHz to 40GHz. and 50 MHz— Low frequency HIRF use electrical parts like an antenna, carrying currents in the fuselage skin. These create little interior penetration. High frequency electromagnetic emissions in the range of 100 MHz and 18/40 GHz — High frequency HIRF generates strong field penetration into the fuselage. 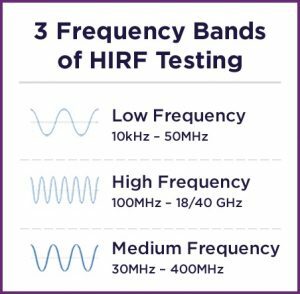 Medium frequency electromagnetic emissions between 30 MHz and 400 MHz — Medium frequency HIRF combine both LF and HF emissions effects. As a result, these emissions mimic both of the antenna-like performance as well as fuselage penetration. HIRF certification generally involves measuring transfer functions to estimate the potential effects of EMI on an aircraft. NTS employs a variety of tools and techniques to produce accurate testing that is fully compliant with all required specifications. NTS can help you meet requirements for HIRF certifications including RTCA/DO-160E/F, Boeing and Airbus requirements, and FAA HIRF Rule & Advisory Circular 20-158. We can precisely measure direct and indirect effects of a lightning strike. When it comes to direct effects, a lightning strike causes damage due to temperatures exceeding 20,000°C and electric spikes of more than 250,000 amperes. To simulate these conditions, NTS facilities have a series of high current generators and an indoor test area that measures 40 x 120 feet. A lightning strike can also create a temporary rise in earth voltages after an impact. This indirect effect creates an intense electromagnetic field that can harm equipment up to a radius of one kilometer. NTS can run a variety of tests, including pin injections, transformer injections, and field immersions to determine the indirect effects of lightning. Together, these tests allow our engineering team to perform a thorough field and transient analysis. This further allows us to assess the indirect effects of a strike on everything from individual circuit parts to complex interconnected electronic systems. The MIL-STD-461 is a standard of the Department of Defense (DoD) that describes how to test equipment for electromagnetic compatibility. Even if this standard isn’t required, a device complying with this relatively strict standard will comply with most other common standards. NTS testing labs can provide comprehensive HIRF and other electromagnetic interference testing for today’s most demanding clients and standards. NTS is the nation’s largest independent product testing and standards compliance organization. We regularly service the needs of military contractors, avionics manufacturers and more. 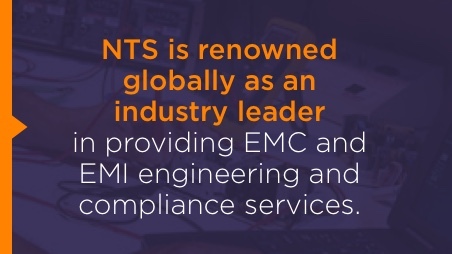 NTS is renowned globally as an industry leader in providing EMC and EMI engineering and compliance services. Our experienced program managers and veteran engineers work closely with you to meet your EMC pre-compliance needs from conception, design and development to final test and production. We have expertise in various EMC/EMI engineering services to perform a variety of tests to meet standards across multiple industries and geographies. With more than 50 years of experience, NTS has a long list of satisfied clients in our portfolio. Clients include organizations like Boeing, Cisco, U.S. Department of Defense, EMC, General Electric, Hewlett-Packard, Lockheed Martin, Microsoft, Motorola, Sony, Pratt & Whitney Rocketdyne, Texas Instruments and Tyco Electronics Corp. Contact us today to learn how we can help your business.